When a bottle of Stone Hill 2001 Blanc de Blancs Sparkling Wine was broken across the bow of the U.S.S. Missouri recently, it was not only a tribute to the winemaker, the winery and the state of Missouri, but also a nod to history. More than a century ago, a bottle of Stone Hill’s Pearl of Missouri (also a sparkling wine and also produced by methode Champenoise) was used to christen a battleship of the same name. The new U.S.S. Missouri is a nuclear attack sub that will be commissioned and go into service in the summer, but the state has a long relationship with battleships, including the one used for the surrender of Japan in August, 1945. And because submarines, even nuclear attack ones, don’t have bows like battleships, it was broken against the conning tower. Jon Held’s parents, Jim Held and his wife, Betty, have owned Stone Hill, in Hermann, Mo., since 1965—and he served two years in the Navy in the 1950s—but the winery has been in operation since 1847, earning medals in national and international competitions throughout the 19th century, when Missouri sent phylloxera-resistant root stock to France and California. The winery was closed during Prohibition and afterward, but the cellars were used to grow mushrooms, and Held remembers shoveling out the cellars and preparing them to age wine. The first naval vessel to carry the name Missouri was a sidewheeler-frigate, a combination sail-steam ship that was commissioned in 1841 and burned a few years later in the harbor of Gibraltar. The first battleship christened with Missouri wine was commissioned in 1901 and was part of President Theodore Roosevelt’s “Great White Fleet,” a group of 16 battleships which circumnavigated the globe in 1907. A second battleship was used during World War I, then decommissioned as part of a post-war arms reduction treaty. The World War II hero served as the flagship for Adm. William F. (Bull) Halsey, using its 16-inch guns in the Pacific Ocean. The ship now is the Missouri Battleship Memorial, anchored at the naval base in Pearl Harbor next to the sunken remains of the U.S.S. Arizona. And it isn’t quite as easy as it sounds to prepare a bottle to christen a Navy ship. 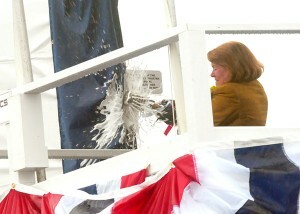 The Navy required three bottles—one to break, one for a backup and one to pass a “fizz test” to ensure that the bubbly would splatter perfectly across the bow when Rebecca Gates, wife of the Secretary of Defense, did the honors. Joe Pollack has been writing and talking about sports, wine, food, entertainment and other happy subjects for more than 50 years for newspapers, radio and TV stations, magazines, newsletters, blogs and other means of disseminating words and opinions. He has children and grandchildren scattered throughout the world and a wife, Ann Lemons, who is a good writer and an even better cook. He writes at St. Louis Eats and Drinks.